The two sets I get to introduce today in this post are two things that I've desired for several years. I was beyond thrilled to make both of them a reality for this release and I can only hope that you will be as excited as I am about them. First is a set I have entitled Leaf Prints. 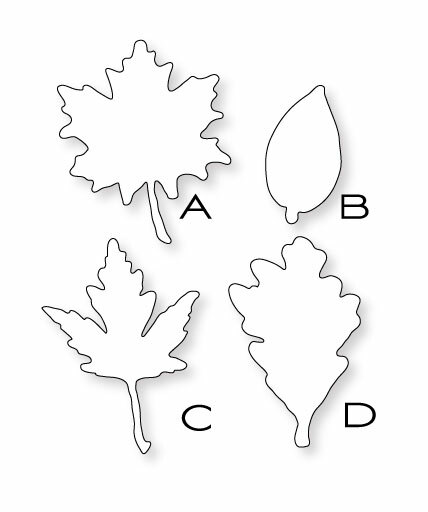 It is a basic leaf set that you can use in a multitude of ways. There are large scale leaves of various styles that are broken into two parts; a solid body and a separate veining image. The two can be layered together or used separately. Each of the four styles of leave sin the set are also provided in a smaller scale with the veining intact as one image for quick and simple projects that may require something a bit more petite. If you have been on the lookout for a autumn basic like I have, than this set will be an answer to your every desire. Leaf Prints will be available for purchase on August 15th. A set of four coordinating dies will also be available for purchase (read more below). In addition to the Leaf Prints stamp set, I have also created a set of four leaf dies that will coordinate with the four largest leaves from the set. I have been wanting detailed, realistic dies like this for sometime WITH coordinating stamps, so having this die collection is like icing on the cake! The Leaf Prints die collection will be available for purchase on August 15th. The Leaf Prints die collection contains a total of 4 dies. 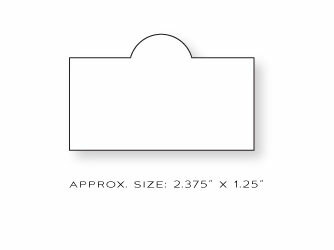 Here are their approximate sizes: Leaf A-2.75" x 2.25", Leaf B-2" x 1", Leaf C-3" x 2.25", Leaf D-2.75" x 2". The second stamp set I get to introduce to you today is a collection of images that is perfectly suited for creating your own place cards for dinner parties and more. If you read my blog frequently, you know I love to cook & entertain and I have always wanted the ability to create really classy place cards to set the table with. This little set does just that BUT I also designed it with versatility in mind. The frame can easily be used in card making projects of any variety as well as the 16 small scale images it contains. Places, Please will be available for purchase on August 15th. A coordinating die for the frame will also be available for purchase (read more below). The small images in this set are all smaller version of things found in some of most popular previously released sets and even a few from this month's releases! To make creating place cards quicker and utilizing the frame on card fronts more convenient, I have designed a coordinating die for it. The frame & die combination should prove to be very versatile and I am sure it is something we will all pull out to use often! The Place Card Die will be available for purchase on August 15th. The Place Card Die will coordinate with the frame image from Places, Please and can be used as a place card front or a standard frame for card making & general paper crafting. One last introduction I wanted to make was on behalf of the new pre-printed collection available for your Color Couture binders that Dawn McVey designed. This month's color schemes are absolutely scrumptious! (If you are unfamiliar with the Color Couture line of products, you can read all about them HERE). 9 Inspiration pages– featuring never before seen samples by Melissa Phillips, Betsy Veldman and Dawn McVey herself. Color Couture Vol. 7-9 will be available for purchase on August 15th. Color Couture Vol. 7-9 includes 27 full-color pages of additions to add to your Color Couture Binder (available for purchase separately HERE). Now that I have laid out all of the details for you, how about we get onto a few exciting projects! The first project I have to share with you today is a special place setting that would be perfect for Thanksgiving or any other fall meal. I created a napkin ring with a strip of Dark Chocolate felt which is accent with Harvest Gold felt that was die-cut with the Eyelet Lace Border. Two of the leaves from Leaf Prints were then die-cut and stitched onto the ring. A few Dark Chocolate buttons tied with Rustic Jute Button Twine finish it off. The place card front was created with the new Place Card die as well as the Places' Please stamp set. The frame was stamped in Orange Zest while the small leaf image (also from Places, Please) was added in Terracotta Tile. 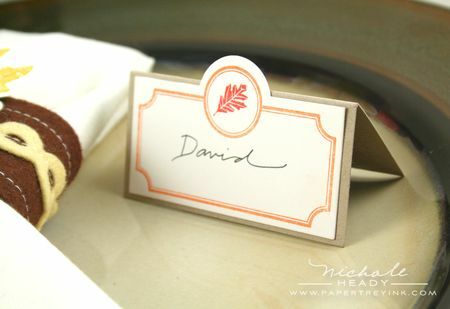 A tent card created with Kraft cardstock serves as the place card's base. I created a candle ring from the leaves as well. I started with a ring base made from a 3/4" strip of kraft cardstock. 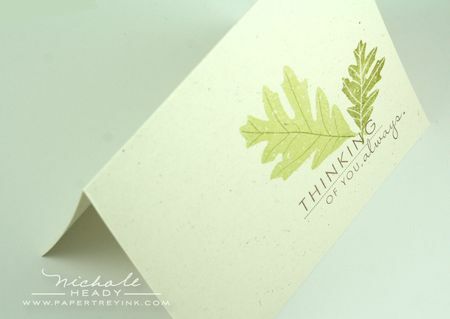 I then die-cut and stamped several of the leaves from Leaf Prints, attaching them to the cardstock ring with Scor-tape. A few Dark Chocolate button were also added to fill in any empty spaces. The candle ring only took about 20 minuted to make since the coordinating leaf dies make it a breeze to cut out the detail of the leaves. If you decide to do this project yourself, be sure to place the ring around a candle that is enclosed in glass. Paper is obviously flammable and you wouldn't want to take a chance on having a catastrophe during your meal! The same place setting could be created in a variety of different color schemes to coordinate with your china or dining room decor. This next card showcases how the new Place Card die doesn't just have to be for place cards. I created a background with Leaf Prints by stamping the solid leaves first with Versamark ink to cover a block of Ocean Tides cardstock. I then followed up with the veining image on top of each solid leaf with Vintage Cream ink. I also swiped a bit of the same ink around the edges to soften the effect. I die-cut the Place Card die from Cintage Cream cardstock and stamped the frame from Places, Please using Spring Moss. The miniature Guide Lines image (also from Places, Please) was added to the top circle portion of the frame with Ocean Tides ink. The "thank you sentiment (from Through the Trees) is stamped in Dark Chocolate. I am sure one you get Places, Please to experiment with yourself, you will find that many sentiments from your collection will fit within the lower portion of the frame perfectly. Almost all of the Fillable Frames sentiments will work beautifully for this! As a special detail I wrapped two strips of Spring Moss Twill around the center of my card and stitched down the centers with my sewing machine. It is a small touch, but it really adds a lot to the project. With the 16 mini images that are included in Places, Please, you will surely get a lot of use from this frame. I am certain a little hunt through your existing stamp collection will reveal other miniature images that will tuck nicely into the circle opening as well! Have mentioned what an incredible value the set is for only $5! And the matching die for only another $5. It's practically like an additional Fillable Frames collection! How about another classic autumnal project? For the focal point on this card I first die-cut Vintage Cream cardstock with the Mat Stack 4 die. I then inked the large maple leaf image with Orange Zest followed by a few taps of Terracotta Tile around the edges. The veining image was heat embossed with Gold Filigree Embossing powder. I love how well the gold works with the autumn color scheme. The "Thinking of you" sentiment (from Through the Trees) was added last with True Black ink. I also swiped a bit of Tea Dye Duo around the edges. I used the Woodgrain Impression plate on the Terracotta Tile background. I also wrapped some Rustic Jute Button Twine around the center of the card to help provide some visual balance. This is a very simple one-layer card that definitely allows the detail & beauty of the Leaf Prints images to take center stage. I stamped the large leaf in Spring Moss, followed by the veining image in Ripe Avocado. The smaller leaf of the same design was then added with Ripe Avocado ink. Notice how the smaller leaves in this set have the veining integrated into a single stamp. The sentiment from Year of Flowers: Lily of the Valley was added on top of the leaf images using Dark Chocolate ink. This design would be perfect for putting together quick note card sets as gifts! I thought it would be fun to showcase a more modern interpretation of Leaf Prints by using the non-traditional leaf color, Hawaiian Shores. I die-cut the leaves from Stamper's Select White cardstock and then stamped the solid portion of the leaf with Aqua Mist ink. The veining was added with Hawaiian Shores. I stamped a few strips from Background Basics: Tin Types on the Hawaiian Shores mat in the back using Fresh Snow ink. This was followed by a few rows of random stitching on my sewing machine. By popping up just the center leaf on foam dimensionals, I was able to keep the card from appearing to be too flat and ho-hum. The sentiment (from Birthday Bash Sentiments) was added with Fresh Snow ink. This last card shows how even the leaf dies themselves can be a wonderful feature for a project even without the coordinating stamps. I sie-cut the leaf from Simply Chartreuse felt and stitched up and down it's center a few time to hold it into place. I just love, LOVE, love how this looks and I look forward to using this technique often with all four of the die shapes. It is a little hard to tell in the photographs, but this project is all about texture. Just the center focal point block is impressed with the linen side of the Linen & Canvas Impression Plate. This was done after stamping the sentiment (from In Bloom) with True Black ink. I also scored around the perimeter of the smooth white card base with my Scor-pal to help frame the center focal point black. Can't you just fill the chill in the air? Like autumn is really on it's way?!?!? Are you beginning to get inspired for fall crafting? What do think of the stamp sets and dies I introduced to you today? We have an amazing prize package up for grabs for just taking the time to share your thoughts with us! This prize package is valued at over $60, so you won't want to miss your chance to win! This contest will close at 11:30pm EST tonight (Saturday, August 14th). Only one comment per person please. One randomly selected winner will be announced by midnight EST tonight on our August Release Winners page. Thank you for stopping by today and good luck. Be sure to stop by Dawn McVey's blog today to see what AMAZING projects she has created using Leaf Prints, Places, Please along with her new Color Couture package! You can also see additional Color Couture projects from her HERE, HERE, HERE and HERE! Wow, this set is wonderful and I LOVE those dies, have been searching for some great leaf dies for ages!! What beautiful fall images!!! These are great. What a fabulous set and those leaves could be used for so many things. Again I just love this whole release and all the great examples are fabulous. 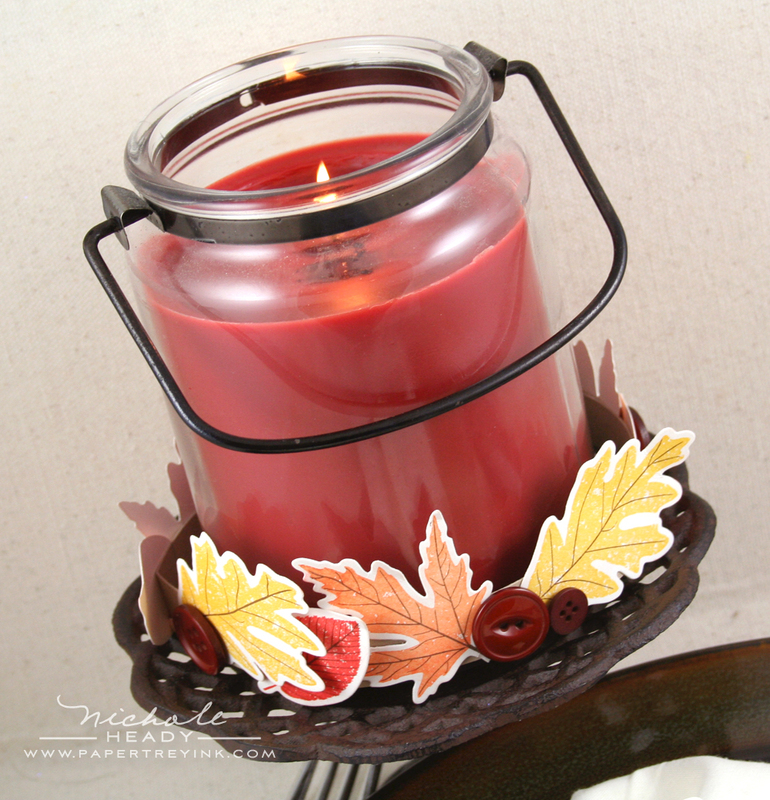 Love the leaves – your candle ring & napkin holders are beautiful. I also adore Dawn’s wreath that she made with the leaf dies. Those place cards are so neat – could definetly use it! Thanks for all the inspiration! I appreciate more and more the fact that your stamp sets and dies coordinate. It makes a stamper’s job much easier and more professional looking. I must say, I think this is my favorite so far this release. Those leaves are to die for. You showcased them beautifully and I can’t wait to get my hands on them! Fall is truly my favorite time of the year and I can’t wait to start decorating my house. Love these leaves especially–absolutely perfect! Can imagine so many ways to use them. leaf prints is coming home to me! Anyone that knows me knows I love leaf print stamps. These are beautiful! And they have matching dies too! This must be heaven!!!! The projects that have been made using these new stamp sets are gorgeous! This set and die will be first on the list for me tonight! Love ‘um! I love the leaves/dies and the placecard set/dies! I’m envisioning a lot of great Thanksgiving table ideas! After seeing your post, you make me want to have company over for dinner! Can’t wait to order it all! I love the leaves and dies! It will be so handy to just die cut and stamp…no cutting out all those intricate curves. I love the place card set as well…it seems very versatile! Great additions for fall! Love fall, but it’s hit or miss here in TX! I remember fall from my Michigan childhood & still love fall-themed crafts. These sets are real classics which can be used for years! I really like both of them along with the dies. Just love the new leaf dies! I prefer not to cut by hand so all of the new dies are a welcome addition to my craft studio!! What an exquisitely delectable post!! I love the table setting idea – I can only imagine how much fun the children would have, helping to put that together – especially using dies for the place settings and the leaves, which makes putting things together a snap!! The beautiful non-traditional leaf colours are so dreamy. I think they could even support an anniversary idea! I’m also imagining these leaves stamped with the new Embellishments set … sooooo much to think about (with longing!) – thank you!! I really love these leaf images and gorgeous products you made with them. I used to entertain a lot and got away from it. Your place settings make me want to start again! Thanks for the contests once more! Love the leaves and the coordinating dies!!! And the placecard set and coordinating die. I can really see myself using these fo a lot of different projects!! Such beautiful leaves and a great idea to have the veins separate. Thanks for the chance to win! 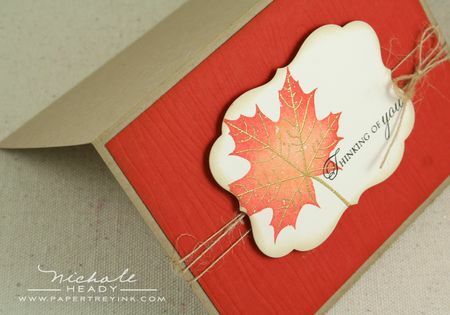 The leaf images are so beautiful & versatile… I especially love the look of the gold-embossed veining on the maple leaf. Love the Places, Please set as well!! The leaves are such a classic….they are sure to be used for a long time to come. And I love to make place cards….thanks for making it easier than ever! Fabulous sets as always!! Love, love, LOVE these stamps! The two-step stamping of solid & veins is just what I’ve been wanting for a VERY long time! The dies are just an added bonus. This is sure to be a classic set that I reach for over & over again. The leaves and matching dies are awesome. I absolutely love all the projects you created with them! These are 2 amazing stamps sets and well worth the wait!! I can’t imagine winning! I love them! I love fall and this makes me remember why! I’m bursting here!! Having die cut leaves is something I’ve always wanted, but didn’t quite know it! And the Places, Please will be perfect for the big family Thanksgiving dinner we’re hosting this year. I have to go work on my wish list for tonight to see how much goodness I can afford. Thanks for the chance to win! Simply beautiful! I just love how you make such simply elegant cards! The leaf images would be so great for a lot of masculine cards! I am putting all my other leaf stamp sets on E-Bay and getting this one! those leaves are just gorgeous! And I love the candle ring you made with them. Thanks, as always, for the inspiration! That thud you might have heard was my jaw hitting the floor when I saw those gorgeous leaf cards!! Love all the possibilities with the leaves! The placecard set is so cute, and completely versatile too. Everything this month – as usual – just rocks! I love autumn and all the wonderful colors of Fall. Great job on these sets. Places, please is a must have and I love the all the leaves; awesome! Fall is my favorite time of year. These are perfect!! Love the leaves! And the Places is a fabulous idea. Yes yes yes!! The leaf set was well worth the wait….I love everything about it! The separate vein stamps and the matching dies of course!! Love the leaves! Beautiful projects, Nichole. I love all of the new sets! Thank you for all of the fun ideas! I knew that I would “fall” in love with those leaf dies and stamp set. Just beautiful! 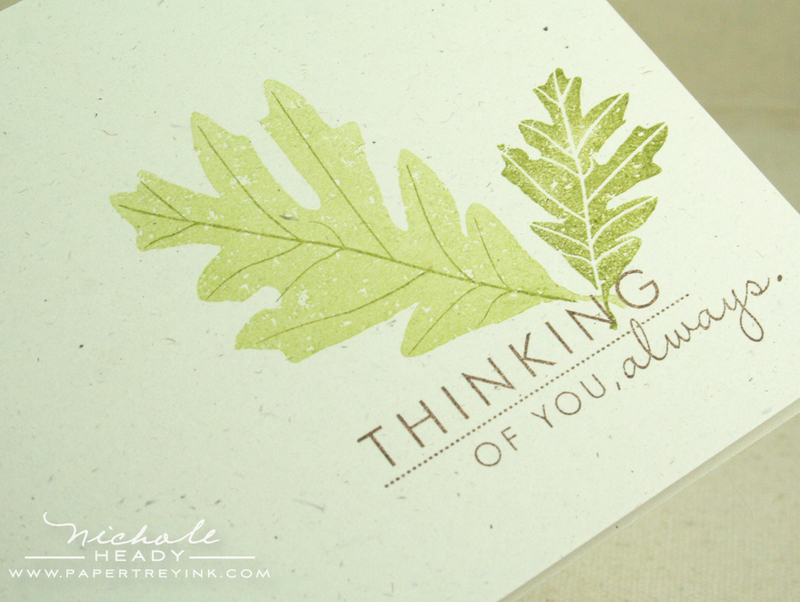 Your third project, thinking of you card with the terracotta tile base, is just stunning. Now to make the tough decisions tonight. You always make it hard! Oh, I can’t wait until the leaves change and the air gets crisp. That only last about a week here in Savannah. These images are wonderful! They remind me of the North Georgia Mountains where my family spend holidays. Fall is my favorite season so the leaves and the adorable place cards are on my list! Gorgeous as always!! These beautiful projects made me cooler despite the heat and humidity. The leaf dies and stamps are heavenly! I will definitely be ready for holiday dinners with the Places, Please. Another fantastic release, Nichole! I’m ready for fall!! These leaf images are beautiful and to have the dies to match is such a bonus!! I’m in love with the leaves!! These would be perfect for so many things…especially masculine cards (which I always have trouble with!)!! Love love love the leaves! … I just love fall, its my favorite season … so the leaves and dies are a must haves! Can’t wait for tonight! Love those leaves! Leaves are so versatile and this set and dies are amazing! Have loved all the examples this month, such inspiration! Oh, I just love those leaves! Absolutely gorgeous!! I especially love the projects featuring embossed and stitched leaf veins! GENIUS! Oh, my…..this is my most favorite post YET! And another truly amazing BARGAIN – Places, Please! There’s just so much creativity in you – you have truly been blessed with an amazing talent! Thank you so much – these will all be mine! Oh my goodness, I think I have fallen completely head over heals with this set! I loooove your card with the gold embossed veins. So incredibly gorgeous! And the place settings, I can’t wait to play around with those and host a few more dinners! My oh my, so many amazing ideas using just the one set of leaves! And matching dies, GET OUT! Love it! A place setting set? Really, oh I can’t wait to see it all. Brilliant idea. I so love Dawn’s Color Couture sets this month! All of her samples are just scrumptious!! Can’t wait ’til midnight! Woohoo! I am beyond excited about the leaves and dies and placecards and dies and oh my. I hope there will be enough to go in my basket tonight. Beautiful projects. OMG! I think this is my favorite so far!!! Thanks for a chance to win! You know, even if PTI didn’t produce any stamps at all I’d still be a huge fan! I just love the dies – cutting felt with a PTI die has to be my favourite occupation at the moment and I’d love to put an order in for the lot! But these leaf dies are absolutely to die for – the green felt leaf card is just about the best card I’ve seen recently! Oh, and I can’t wait to see the other little images in the placecard set – I’ve volunteered to make Christmas party placecards for the two voluntary organisations I’m involved with – PERFECT! I am ready for Fall and a “chill” in the air as it is still in the upper 90’s here! Acckk! The place setting set and die are an AWESOME value and I know I will get so much use out of them! Also , the leaves (and dies) are absolutely beautiful! Thanks again for an inspiring release!!! I am SO ready for fall….it is my favorite season. The Leaf Prints stamp set will be a great addition to my autumn array of creativity!! The dies are a great addition also. I love everything in this post, the leaves are so elegant and versatile and places,please it’s just gorgeous and for that price!!! Thank you again, now I know that I will be going late to bed tonight, I don’t want to miss anything!! Gorgeous leaves! I can’t wait to see all of the place card images. What a great idea! Thanks again for such lovely projects which motivate me to shrug of end of summer laziness to get to the fall project fun! Of course, I WANT IT ALL, but IF I could only afford the leaf die and some of that yummy Chartreuse felt, I’d be one happy little crafty gal — that leaf cut in your green felt is just too cute!!! The leaves set and dies are a must have. The gold veins on the one sample are just gorgeous. I can’t wait for fall to be coming around :). Oh my goodness Nicole-these sets are BEAUTIFUL!! Fall is my favorite time of year (shh don’t tell Summer!) The leaves! The dies! Oh my! Soo many possibilities for them all, where do I begin?? My mind is just whirling with all the possibilities for both the Leaf Prints and the Places, Please stamp sets. The cherry on top is having the coordinating dies. I’m always try to create place cards and this combination will be just the ticket! Totally LOVE Places, Please! Awesome value to get the stamps and die for only $10!!! That will get used TONS in my house! I love dressing up a table with place cards! I LOVE these leaves and how easy will it to make a bunch with those awesome dies! I can’t wait to get my hands on these! Beatiful projects with gorgeous new products. I’m amazed every time charming pieces. I so love these stamps! My shopping list is swelling by the moment. Love the Places please frame and die! The versatility of the leaf set is fabulous, and Dawn McVey always pleases! So many ideas leap to mind when I see these two stamp and die sets. You’ve done it again [and again and again…]. well everything is just stunning! i don’t even know what to say other than that! I’m such a fan of leaf images! This will be a great addition to my stamp collection…and of course the dies as well! The leaves are beautiful and the dies make buying the stamps an easy choice, but the buggest shock is the places, please set – $5? really? I still almost don’t believe it. What a wonderful frame and die set. I think it is absolutely perfect for entertaining. I would love an invite set to go with it! The color combinations from Dawn this time are absolutely fabulous too… fall is on the way- can’t wait! I think this is the best yet! I love the separate solid & veining stamps and the coordinating dies – perfect! These sets are fabulous, Nichole! I’m so ready for fall now, bring on the gorgeous autumn colors and crisp air! Again? What can one say? You’ve done again. Awesome stamp sets and dies! Also what a neat idea for the candle & napkin rings. WOW!!! Your projects are gorgeous Nichole and this set looks wonderful and so incvredibly versatile! I’ve been waiting to come autumn. The leaves are so beautiful. These are fabulous Nichole! The leaves are wonderful-very natural. And the fact that they have dies to match makes them too good to be true! Your creativity is so inspiring! I love the candle ring you created from the leaves – so perfect for the autumn! And the Places, Please set is a must have, especially for the price! I just LOVE this set! My daughter is getting married this fall and I can see so many wedding detail possibilities: out of town gift bags, rehearsal placecards, “fall themed” tags on favors, etc. It’s the perfect fall set. Great job with designing and all of the wonderful, creative ideas. Oh poop! This is something I didn’t think I needed and now my list has changed again!!! What a pretty table setting the leaves make and I have nothing like the places please die and set. Ugh, decisions, decisions, budget, budget. Places, Please is definitely going on my list (and what a cute name for it!). I’m swooning over the embossed veining on that leaf, too. Your cards are the best! Love those, so stunning and rich! I especially like the friend sentiment. Beautiful, I love the leaves and the place card set looks so versatile. What fabulous sets! These are both “must-haves” for me! And don’t forget about the coordinating dies! Love love love it all! Thanks for another great release, PTI! These leaves are simply beautiful. Even just scattered across a buffet or the dinner table at Thanksgiving would be pretty. These are fun projects and awesome sets! I’ll definitely be getting them: affordable, too! I am so glad I caught this post. I love the leaves, the stamps the dies, just wonderful. Such a great stamp set for Autumn. I love these leaf images. I generally love nature stamps. These are really great and the matching dies are fantastic ! Love those leaves & the co-ordinating dies – you and Dawn have really show-cased how great they are for home decor projects. Oh man, I really gotta have all of this! Love the leaves, especially with the dies! That placecard combo is genius, too. Oh boy. Just in time for Thanksgiving and fall celebrations. These leaves and dies are just out of this world. Thank you for your creative ideas that you share with all of us. What gorgeous projects, Nichole! 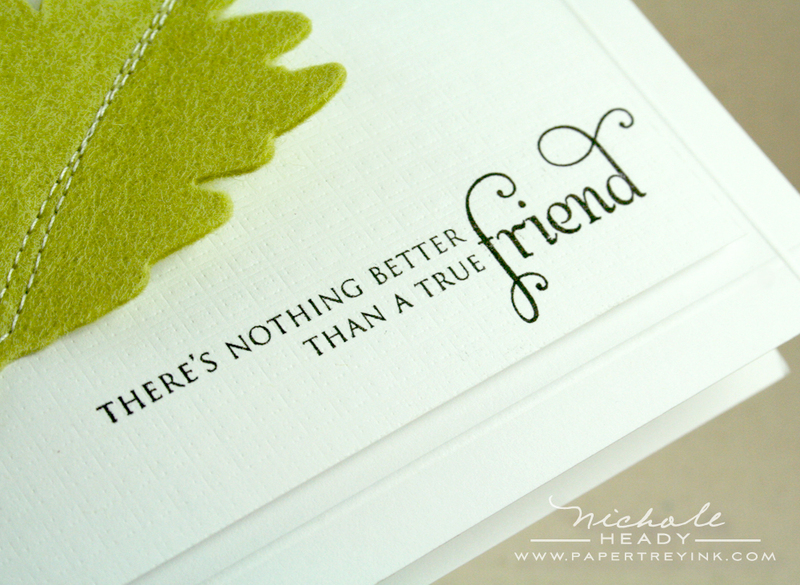 I especially love the simple Thinking of you card and the felt True Friend card–they are both so clean and simple but stunning. I love leaf motif things, and I am definitely getting the Places, Please set and die–what a bargain those are! I love that place card and die! I can’t wait to see what all images are included. Those leaf dies are amazing! What you did with the felt – spectacular! Love that one! The leaf images are amazing. I love all the simple cards you made with this set. I can’t believe that the place card set is only $5. I was expecting $15!! The large leaves are fantastic! Can’t get wait to get my hands on them! So wonderful and amazing your projects. Love the leaves a nice big size. What fabulous creations. This little lot are calling my name ! These have to be the prettiest leaf images I have seen, and to have a die to cut them out with is just the icing on the cake!!! I love fall, and this post, just makes me long for it even more. Thank you for all of the inspiration these last few days…I can’t wait until tonight! Love the details of the leaves and that they have matching dies. The candle ring you created with them was beautiful. The places please set is cute and you have shown it how it can be used for place cards and more. This is my favorite so far this release! So many possibilities, can’t wait till purchase time! Oh, these leaves are all beautiful and so fun to have the matching dies. Thanks for the chance to win. Even in my early days of scrapbooking, leaves were my favorite and this amazing combination of stamps and dies does not disappoint! Well done! Those leaf prints are to die for and with matching dies, well, how can I resist?! I absolutely cannot wait to see the full reveal of this month’s releases! Wow! Ity is 101 degrees here today but I am feelin’ fall after seeing your projects. I love everything especially the felt leaf. Awesome! Stunning! After all the great projects you have come up with for this reveal, I wonder “how are they going to top themselves next time around?” I know you will though. Thanks for so much inspiration! The stamps sets, dies, and extras are fabulous! Thank you so much! I couldn’t wait to see this set (Leaf Prints) in your hands. Fall is one of my favorite seasons and both of these sets help put its beauty on paper. Wow! I didn’t think it could get any beter, and then it did! What wonderful ideas, can’t wait to order or for the new supplies to arrive at my door. Thanks for all the great ideas! I love autumn. And this set is perfect. I too have been wanting leaf die cuts. You did that and more by making a coordinating stamp set. I adore fall leaves, so all the stamp sets and dies you showcased today have to come to my house, whether by winning them or by buying them! Thanks for all your creativity and for the chance to win. 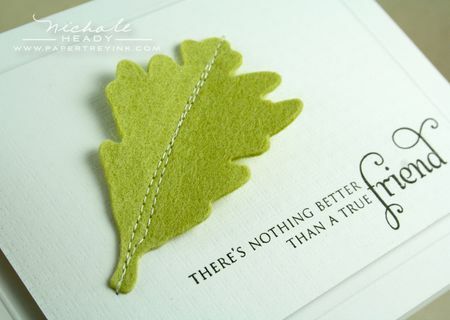 Great images in the set….not so fond of cutting out leaves, so the leaf dies are just to DIE for!! Love the new place setting stuff! Just stunning! Oh my, those leaf images are to die for. Amazing set. Love the dies too. I really like the colors for the Couture line. I am collecting all of them. They make such beautiful cards. Can’t wait for tonight! I have a ton of leaf image stamp sets, they are one of my favorite things to stamp with. I can see I will soon be adding another set to my stash. The coordinating dies make it just perfect. I’m really excited to cut out felt leaves with the new dies! I’m already building my Thanksgiving center piece in my head! Love those giant leaves! I am so inspired for fall crafting!! Now I just have to figure out which sets to order this month. Hmmm…may have to draw from a hat! HA! Love the leaves and the coordinating dies!!! Matching dies has to be the best idea ever, and each month I love them more! Lovin’ everything this month!! What really awesome ideas. I truly am amazed at all you do and how creative you are. i can’t wait to see everything tonight. What a fun set! The leaves are amazing and can be used in so many different ways! I also love the coordinating die! Can’t wait for the full release tonight! Wow some beautiful projects today! I love that leaf set, so many options with that one. The perfect leaf collection! Love it all! The leaves are just perfect and Dawn’s Embellies … fabulous! Well done, again! I just love that blue card, Nichole. So, so classic and elegant looking, yet so, so simple! Love the leaf dies. And Places, Please will get lots of use. Thanks for a great monthly release again. Omigosh… the leaf stamps WITH dies and the separate veining. WOW! I am always kind of in awe of nature when I pick up a gorgeous fall leaf, and this ensemble is the perfect thing for creating such beauties myself! I also love the classic shape of Places, Please. Looking forward to the whole reveal! Places stampset and die for me please! I love the look of it and can’t wait to see which small images are included in the set. These leaves are very versatile. Thank you for sharing!! This leaf set is absolutely beautiful! Makes me wish for fall! I want it ALL!!!! The Place Card die and Places’ Please stamp set is a must have for me. So many possibilities for the holidays! The leaves are beautiful! It’s nice they can stand on their own with or without the dies. And I like the two different sizes. I love the placecard set also – my daughter is getting married this October and we need to make placecards for the table (and maybe leaves scattered on the tables???) Got to have these sets! Thanks so much for your ideas! Falling for your “fall” sets, LOL! Seriously…another elegant and lovely package. And, Dawn always comes up with extraordinary creations. Thanks so much! Fabulous cards and projects. I can’t believe the place setting set is only $5. I’m a fall girl. Always have been, always will be. Leaves and acorns are my favorite images. Love the veining on these leaves. And now, no cutting involved. Who wouldn’t love that?! I think this may be the perfect leaf stamp set. The size of the leaves, the veining, the companion leaf, the dies. BEAUTIFUL and elegant. I appreciate all of the variety you showcase in your countdown posts, too. Makes me ‘need’ every stamp set. I can’t believe what a great value ‘Places, Please’ is. I didn’t think I would need this set at all, but now that you have shown what it can look like on a card, I am Sold! Thanks! Places, Please is amazing & versatile. Love the Leaf set also – so beautiful and well thought out, as always! Nicole, the leaves are gorgeous! I love fall, love leaves and LOVE your fabulous creations–so perfect! Thanks for this wonderful new addition. And the place card set and die will be great for so many occasions. An inexpensive must-have PTI jewel! OK, sold! This will be mine! LOVE LOVE LOVE IT!!!!! What a beautiful leaf set! The coordinating dies are a must have as well! I have been wanting a place card set for a long time. Thank you! These leaves make me ready for cooler weather. They are beautiful. I wish I could feel a chill in the air! It’s been over 90 degrees for the last 40 days and I don’t see any cooler weather coming yet – lol! Love all the great ways the leaves were used in the projects. Beautiful, as always! Can’t wait to get these! The leave images are amazing. I also love the look of the gold embossing on the leaves. This release is simply spectacular! Can’t wait to see it all tonight! WOW…just beautiful! I can’t wait for tonight to see everything in detail! PTI, month after month, you NEVER disappoint! Thank you for all your creative, hard work! This leaf stamp set and coordinating die set is by far my favorite thing this release. I love how neat the veins of the leaves look!!! Love the place setting stamp and images, too! Can’t wait to see the rest of that set! 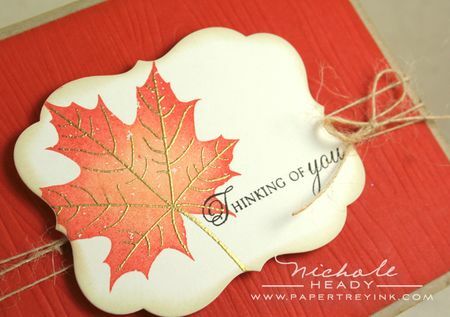 I love the leaf stamp set and dies…..so perfect for fall….and your cards are beautiful. These sets and dies are just great!! 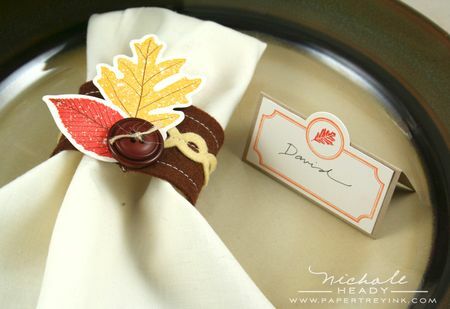 I love fall leaves so much, and the little place card shape is so versatile. The leaves and dies are great together. The color couture is full of fun color combos. I adore the simplicity of this stamp set! I love everything about fall — pumpkins, leaves, and acorns. I am sunk this month; I want everything!!! These projects were well worth waiting for! It has been so hot here that it is pleasant to just think about fall, and these leaves sure do help! Just beautiful!! 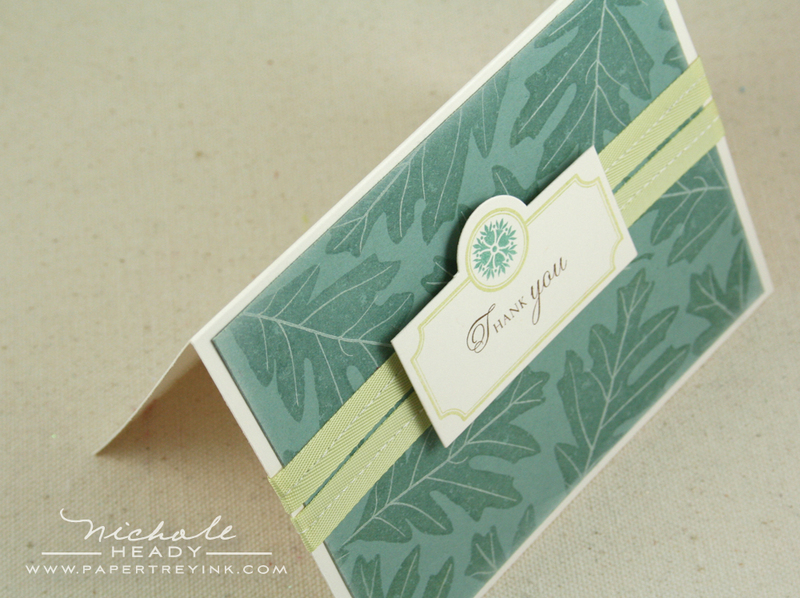 I love all the different options you’ve shown with using the leaves and coordinating dies. These will find their way into my collection for sure! I absolutely love the idea for the place cards! Too cute! Can’t wait to see what’s in the rest of the set. Fall is such a great time of year, and the leaf set captures that fabulously! And matching dies! How great will they be for making all sorts of leaf decorations?! Love the places, please. So cool! I have some leaf stamps but I like these better – especially with the custom die so I can have cut outs super quick! Love it! Love the leaf prints and dies. They will make beautiful cards and decorations. How creative! I love the napkin ring made from the felt and the leaves and buttons. This entire set is a must-have for me! Love the leaves. What a wonderful table it will make for Thanksgiving. 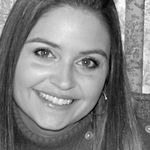 Nichole, you and your team have really outdone yourselves! I LOVE the Leaf Prints and the accompanying dies. FABULOUS!! The placecards are so terrific too. I sometimes like to set a formal table complete with placecards….now I don’t have to run to the Crane store! Thanks a million! OH MY WORD! I love these!!! They are so beautiful! 🙂 I can’t wait to get a set!!!!!!!! I am in love with those leaves!!! And those sample projects are amazing. I am so ready for fall to come. The place setting is so elegant – makes me want to throw a dinner party (someone else will have to cook, because I sure can’t). OMG your golden maple leaf card speaks to me!!! The #4 die is so pretty, a very fluid shape. I grew up on a farm surrounded by beautiful old sugar maples. This set is a must-have for me. Thank you. I was waiting for a leaves stamp set just like this one; thank you for making it whith the dies! Leaf prints are just too cool – I’ve already started thinking about some fall projects! I’ve been looking for some more leaf images and was so excited when I saw the sneak peek. Leaf Prints is amazing and I’m so excited at the thought of the dies too. Love your projects and caan’t wait to use the set! Absolutely the coolest leaf stamps I’ve ever seen. Thanks for the chance to win the leaf set. I love the leaf set. I think I would make a wreath, like Dawn’s. I’m so ready for fall! Bring it on! Beautiful ideas, yet again! Dawn also did a great job showcasing this set today. Thanks for sharing the ideas and for the chance to win! Very cute! I love the clean white card with the green felt leaf. Love the leaf images and the dies! Thank you for the wonderful samples and the chance to win!! These sets are amazing. I love the leaves and I can’t believe the Places, Please set is only $5. Thank you for showing the versatility of the set. I love all the dies you are adding, makes crafting much easier! The leaves and dies have been needed for a long time!! So excited that PTI is offering them! Places please is fun too! Will go check out color courture. I know a special little someone who would love these items for her birthday…..Saturday August 14th……ME! This is just lovely and exquisite! I love the beautiful leaf images…they have a very elegant look to them!! Love the place settings and leaves! Found myself looking for leaf dies a few weeks ago and to be able to have stamps and leaves matching! Beautiful samples as always. Leaf images never go out of style and these are just beautiful! I spent all day outside with my little girl and it already smelled like autumn! The grass is full of acorns already. I love the sets you introduced here! The leaves are so beautiful and what you did with them!! Wow! That candle arrangement is gorgeous! More leaves!!! I love leaves. beautiful leaf images and the dies make a great set! places please and the die are going to be great too, i always make place cards for thanksgiving and this will be perfect! Again you have read my mind. I have been wanting a leaf die to use with die cut flowers (hand cut just doesn’t ‘cut’ it HAHA), so thank you for another great release. The leaves are beautiful! Love the dies that goes with them too. This is not going to be an easy month! I thought perhaps I would not be getting any new stamps this time…but all the previews have totally rocked! Help!!!! This leaf set is GORGEOUS!! And what beautiful cards and projects you’ve made! I LOVE to set a fancy table even if it is just my hubby and I and a take out pizza! LOL! Can’t wait for these sets!!! LOVE them both, and your samples are over the top as always, thank you for all the work you put into your samples every month. I always look forward to seeing your ideas. I am really loving the leaf prints and the dies that go with them! The place cards are a fabulous idea too. What a great release this is!! You are a girl after my own heart! I think leaves are perfect for so many occasions and to have the co-ordinating dies…it makes my heart happy! Thank you for sharing all you do! Those leaves are gorgeous!! Can’t wait to get my hands on them! Also looking forward to another edition of Color Couture! WOW!! I love the leaves and dies. A must have for me. I love leafs in any size or shape but these are just wonderful… makes me wish the fall was here already… but this gives me the chance to start on my fall creations early!!! Great inspiration!! oh yea! I’m lovin’ these sets and the dies to match! Your samples showcasing these are fabulous! I just love the different kinds of leaves and the delicate veins that are included. You think of everything. What a fun new set–Places, Please. This will make setting a table a big treat. Fall is my most favorite time of year and kudos to all you lovely ladies as you have outdone yourselves for this season. Your imagination and creativity are awe-inspiring. I just can’t wait to have all the goodies this month…guess my bills will have to wait. You all rock! beautiful stamps and dies and simply beautiful creations you made with them! thanks for a chance to win and most of all for the inspirations! Love the place card idea and all of the fun possibilities it offers. I can’t wait to see everything unveiled tonight! The leaves and dies are my favorite from this release and at the top of my list. So inspired by all of your projects and can’t wait to start creating. What lovely additions to the PTI product line. The leaves are just stunning and that Place card set will be so useful. I have dreamed of the perfect leaf set for quite a long time. Now I don’t have to dream about it. PTI has made the leaf set of my dreams! The Places, Please set is fantastic, too! Thank you, Nichole!!! How wonderfully brilliant Nichole! This takes me back to collecting leaves and making school projects!! Just love it! Love the sizes of this set w/dies! Really versatile…as all of your designs! the leaf set looks just beautiful! can’t wait to see the whole set! 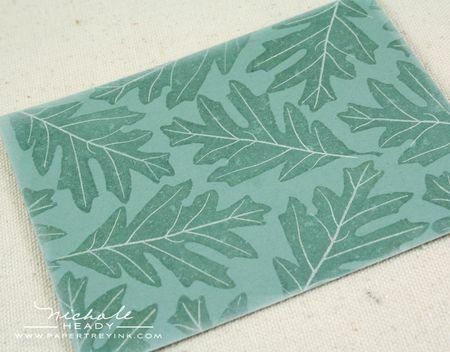 Nichole—these leaves are lovely—and I love the Places, Please—this is a set I will use OVER AND OVER—I already stamp place cards for any special meals we celebrate, so I’m thrilled to see a set made for this–and at $5–it’s a MUST HAVE! I can’t wait until tonight! I don’t know why I’m always surprised when I see such fabulous things from PTI. But I always think, ‘well, they can’t top that!’ and then you do. Simply amazing. Who knew there could be such excitement surrounding leaves? Love it! I absolutely adore leaves of every kind! Fall is my favorite season of the year and one of my favorite color palettes to work with. I find myself returning to it over and over. I would love to add these stamps and dies to my collection. I can see myself reaching for the leaf set time and time again. Love the coordinating dies. OMG, I have been looking for a good leaf set and now I have found it. The stamp set alone is wonderful but and the coordinating dies and it becomes magical. Thank You so much for created such a beautiful duo. Love the leaves and all you showed that can be done with them! Your leaves are beautiful. Dawn’s wreath shows them off to perfection. You have outdone yourself once again! Just really beautiful, and absolutely awesome that there are co-ordinating dies, especially for the leaves. I have to say that I have loved it all, and now for the tough decision about what to purchase, especially when one wants it all!!! Is that too greedy?! The leaf prints are gorgeous and even better because they have matching dies. Your place setting is wonderful and that wreath that Dawn made is unbelievable–75 leaves!!! This has been a wonderful release, thank you for all the new ideas. you make me want to have a dinner party just so i can use this set. very cute! i always love how you ink the edges of your papers, i forget to do that. it does add something extra! Lovely leaves and matching dies – oh joy! I love the new Places Please and die as well. Definitely need those! I love the place cards though I am in denial that Thanksgiving is around the corner. I can’t wait to play with this new fall set! Once again you’ve outdone yourself Nichole. The Leaf Prints and matching dies are wonderful. So many possibilities that the mind in spinning! The Places Please is an awesome value. Thanks for all your hard work. Simply beautiful – love your concept of the leaves and dies and the detail that has gone into them. So very effective and stunning. The gold embossed veining was a winner! I love all the leaf dies. I have not been able to find any. I love all the stamps with matching dies. My new must have. Everytime I see the color coture sets, I think “I’ll never use that.” But I see all of the beautiful projects made using them and my mind is changed. Love the Places,Please set and die – so versatile! Can’t wait ’til 11 when we can see all! Love the leaf dies! So many possibilities for crafting. The projects using the leaves are so beautiful and serene. So awesome to have a coordinating leaf die! nichole, you have out done yourself! i love the leaf prints and matching dies! have you ever cut out 50 stamped leaves??? i did one year for thanksgiving cards and i have to say that i would have given my right arm for these dies back then! and the places, please set is wonderful! Fall is my favorite season – the crisp air, the colors, the leaves and all their textures. This set will truly add to the beauty of the season! LOVE it. Beautiful leaves! I love the felt leaf card. Simple, gorgeous, I want it! Ack, I almost missed seeing this one, how cool! Love the leaves. Wow! Yet another great set! Love looking at the bright ideas! I still have to go on my summervacation but let the fall begin! LOL! 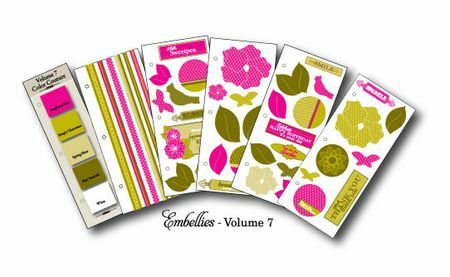 I love the leaf stamps and dies, they will fill a huge void in my stamping collection! What great new sets! The leaf patterns are so pretty. Nicole you always do such a wonderful job with the illustrations. And I am so excited about the Places, Please set. It looks like it will be so useful. Can’t wait for the reveal tonight. I totally LOVE the fall leaf images! You always seem to know just what we stampers need and then you fill that void. Thank you so much for that. Wow! What a great set for fall. I can just imagine how much fun this set would be for all of the fall card making. Thanks for another great stamp set. The leaf images & dies are everything I hoped they would be! I can’t wait to add these to my collection. What a beautiful set! Simple & elegant, like many of the other Papertrey sets. The dies of the leaves are wonderful! I can’t wait to use it on paper, felt, and other items. Fall is my favorite time of year…I love to see the leaves changing colors as I also LOVE leaves. What a great set…and dies to coordinate… brilliant..can’t wait til the release! I just love the leaf set. The size is great, and the dies are to die for!!! Love, love, love!!! I have been waiting for a perfect autumn leaf set and I believe this is it! The coordinating dies are like icing on the cake! And what a great value for the places set – I can see using the set and die for small package toppers too! I continue to not know what to say. These leaves are gorgeous. I love the place settings. We like to do these at lots of get-togethers, not just holidays. Thank you! Gorgeous leaves! Thank you for all of the wonderful inspiration and I’m looking forward to the reveal this evening!! Fall is my fav. season and when I saw there were to be leaf dies & stamp set I just about fell over Oh my gosh… How lucky will one person be tonight! In East Texas with day of 97-102 — we are ALL ready for fall. I’m so impressed with the variety of ways the leaves can be used! I think I’ve said this with each set yet, but seriously this is a MUST HAVE. I LOVE leaves and the dies to go along with the stamps are amazing! The leaf set is gorgeous and having matching dies is wonderful! Places, Please is fabulous and could be used so many ways. Another awesome PTI release! What wonderful sets–well worth the wait! Oh, this is beautiful! You have taken my breath away with each post this week. 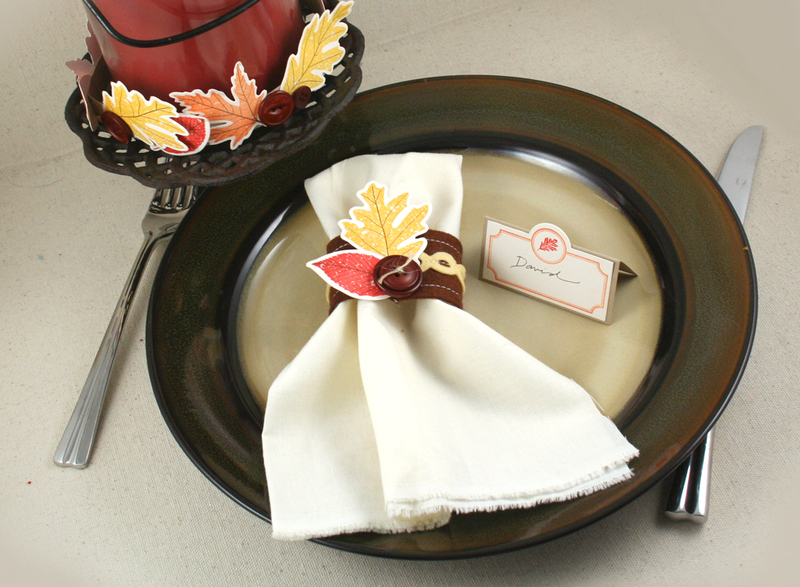 These leaves and place settings are absolutely beautiful and a must-have for any season! Can’t wait to get them! Very stunning! I just love the leaves with the gold embossing, and the Hawaiian shores leaves are super! Wow. The leaves are perfect and the way the dies and stamps work together in trademark PTI way is awesome. I can see places please being very popular too, such great value! I love it all! I could never pick one thing! Simply stunning stamps! The projects are beautiful!! I love fall leaves and look forward to creating them to add to cards, tags and gift wrap. Thank you for all of the fun contests this week! Saved the best ’till last I see Nichole! Well I say that but all the projects and sets this month have been outstanding! Can’t wait to get all these goodies tonight! I just love Fall — it’s my favorite season. These leaves with coordinating dies are exactly what I’ve been wanting for a LONG time. Thank you! Leaves are perfect for cards all year round. What a beautiful set! Places, Please is just an amazing set. And the leaves are so beautiful…love all the fall images and colours. They just “sing”!! Oh my! These two sets are must-haves for me! The leaves are SO realistic – I love how you used the cream as the veining and the gold is too perfect! The place card set and die are a no brainer – everyone has to get it! Goodness me – my list for tonight just gets longer and these two new sets will definately make waking up at 4am worth it! Oh my, gorgeous leaves, love all the ways you highlighted them. And that amazing place card, absolutely brilliant! The leaves are really beautiful and the place cards were really well thought out. These leaves are so pretty and will be a great go-to autumn set. My favorite example is the “non-traditional” one in Hawaiian Shores! I also love the place card die and stamps. I was thinking they were very similar to the Fillable Frames and would have a lot of interchangeable elements! This is going to make holiday place cards a breeze.And so pretty too. Fall is in the air! I love the leaves and the coordinating dies. What a terrific combination. These sets are on my “to buy” list! Gorgeous! Beautiful samples and a set perfect for fall! The leaves are beautiful – and will make some wonderful and elegant cards for fall! I love, love, LOVE Leaf Prints! I’m always buying prints of leaves and trees — and the some of my upholstery has leaf designs woven into the fabric, too. I can’t wait to see all of Places Please — the price can’t be beat, so it’s a definite must have! And matching dies for all — heaven! I love stamps of leaves and these ones are gorgeous! Fantastic projects. TFS. Gorgeous! Can’t wait for release night tonight!! Love the leaves! Looking forward to getting this beautiful set! Beautiful fall leaf images-and dies -some great projects – love the imbossing with the gold. I love fall settings, and setting the table is a hightlight…now it will be that much easier! thanks pti! I’m so impressed with all the great samples!! Love how clean and simple they are, and not too time consuming. This is so exciting! I just love these leaf images and matching dies! Beautiful work Nicole! This set is so beautiful! Fall is my favorite season because the leaves turn so many different colors. So this is a must have for me! TFS. I am a sucker for leaves, almost as much as flowers and the coordinating die-cuts make this almost irristible! I think the Places, Please set is darling and can see very many for it as well! I can see using the place card die for my son’s wedding next year….now I need a beachy theme stamp set to go with it…I know others would low it too! Soooo fun! I love the die cut felt leaf! Wow! What a big release for this month! Maybe it’s time for the I want it all button. Awesome job PTI!! Awesome as usual. What else can I say. Except possibly that I can’t wait for tonight. Wow! I love the leaves! I especially love that the “veins” of the leaves appear to be a separate stamp! These projects are just beautiful! I love the new place card die — awesome! Before I saw the pictures I was thinking, “Do I really need a leaf stamp or die?” YES, YES, YES!!! I really do! :o) These are aMAzing! What a beautful leaf set. And dies to match! Wonderful. I love the table place card set too. Wonderful ideas as usual. Thanks for you thoughtful designs, Nicole. Leaf dies? And those leaf stamped images are gorgeous, esp with the embossing. My list is growing as we speak. LOL. The leaf dies are incrediable! Thanks for designing them! Wow, these are so cool! The leave images are just fabulous! And love the idea of the veins being separate! How neat! What beautiful leaf cards. You have another winner on your hands. The many colors of fall leaves and their crunch under your feet are always welcome. What gorgeous leaves! I love the versatility of this set and also the coordinating dies. Nothing like this has been on the market yet – PTI to the rescue! Gorgeous card samples too! Oh my goodness, these are lovely. I do love leaves. I love these new sets – I love anything to do with autumn – yes, even chilly weather! Wow, what a great release. I’ve liked all the stamp sets and these leaves especially. Each Thanksgiving I made favors for the guests and I could sure use the stamps and the inspirations you and your design team have been sharing this week. Thank you so!! You make me want to get in the kitchen and start cooking for a dinner party so I can have a pretty table!!! Thanks for all your hard work and another set for just $5? add it to my list!!! Gorgeous set and cards. As usual. I absolutely love the leaves. And your places please set comes at the perfect time – in time for the holidays. Thanks for the chance to win. I love love love the place cards. Thanksgiving is always celebrated at my house and I have never seen a stamp set to make my place cards with this is in my cart…..
these leaves are gorgeous and the fact that the veins and leaf part are seperate stamps is genius!! Love these leaf images and dies. My mind is racing with ideas for scrapbook pages, home decor projects and maybe finally getting around to making a family tree project I’ve been wanting to tackle for some time 🙂 Your projects were so inspiring as usual and I can’t wait to see everything in their entirety tonight! I can’t get enough autumn images and these are just great! I love the place setting set, too. I think it could work for a variety of projects! Just gorgeous!!! I love all the projects, simple and elegant. Fall is my favorite season. This set is pure heaven! Great for masculine cards as well. As someone who lives in the mountains, and loves to watch the leaves changing colour every day, this set is a MUST have for me. I can see being able to make many masculine cards for my mountain loving men too! Gorgeous. And I just love the dies – many ideas already spinning around! The leaf set and die looks so nice. Wonderful placesettings too. Love doesn’t describe how I feel about the leaves and dies. My shopping list is long this month. Fall is my favorite season. Oh how you hit a spot in my heart. 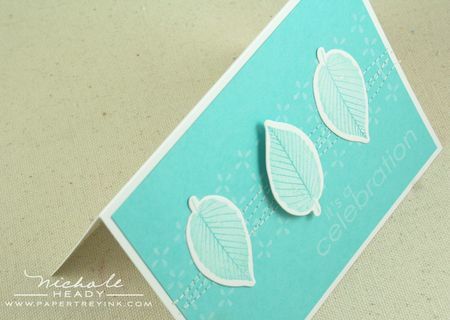 I love leaf stamps and these are fabo!! Thank you! 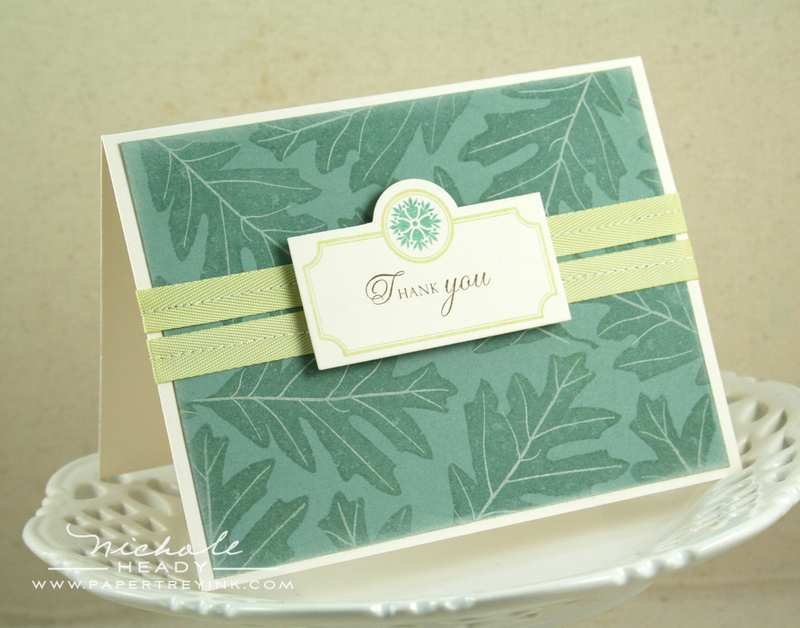 Oh, those leaf stamps and dies are so wonderful! I love the idea of having a separate stamp for the veining and I’m so happy that you came out with leaf dies! You guys are the best! Imagine all the possibilities with those leaves and coordinating dies! I’m drooling over the felt leaves. Would love to see a wreath made out of them. I love this leaf set and dies to match, your candle ring is awesome what a great idea, fall is my favorite time of year! I have been waiting for the leaf set and those dies are to die for! That gold embossing you did was beautiful! Been waiting for a leaf set like this one. And dies to match. Loving it!!! Uh oh. My list has just gotten even longer and I still have a list from the previous releases! I can’t wait for Fall! These leaves are just beautiful! I’ve been hoping for leaf dies for such a long time! The images to go with them are a bonus for sure. I love the versatility of Places, Please and look forward to more sets to use with the matching die. Thank you again PTI! I like the distressed look of the leaves. Plus, they work well for masculine cards. OOooohhhhhhh…love both of these sets! I’m so excited about the leaf dies to go with the set!! Whoo-hoo!!!!!! These are the leaves I’ve been searching forever for! And there are dies!! I am so going to have these for my stash!!!!! I love the leaves and dies! I can see myself using them on so many projects. Thanks for the chance to win. This might be one of my favorite sets. I love the dies! I can’t wait to see the other images in the Places, Please set. I LOVE what you’ve done with the leaves and dies Nichole! My mind is swimming with the possibilities! Love the place card stamps and die too. Even though I rarely make place cards I can see myself using these for many other projects! Gorgeous! I love the separate veins also. Elegant and beautiful. lovely, lovely, lovely. I’m eagerly looking forward to the leaves set and coordinating dies – having the solid image and the veining as separate stamps is brilliant. The place card mini set is sure to be a must have, too. Oh I love these, can’t wait for tonight. As usual, y’all have done such a great job this release. Autumn is my favorite time of year. I can’t wait to make some scrapbook layouts about my love of fall. This stamp set is perfect. I love the gold embossed leaf veins. That looks so cool, as does the subtle color change on the leaf itself. Great ideas for all kinds of things! The leaf images are beautiful and the whole set is so versatile. I especially like the blue leaves on the Celebration Card. Can’t wait to stamp them on vellum in aqua mist! These are beautiful! I love fall colors – awesome again as usual! Ummm, WOW!I’ve been waiting very patiently for the leaf prints and the leaf print dies, and they are sooo worth the wait! I’m drooling! With a November birthday and living in the Pacific NW, we have lots of autumn leaves around here! Thanks Nichole! The leaf images and the dies are fabulous!! I have no idea how I am going to choose my purchases this release. I truly want it all!!! Absolutely amazing! The Places, Please set is great & at only $5.00 it sounds like a steal. I’m going to have to stay up late tonight so I can be sure to get this one! After seeing Dawn’s post with the wreath, this leaf set is a must. Plan on purchasing the place card set as well just because of the good value. Another awesome month DT team! So gorgeous!! Love those leaves and the dies make them so great to put to use! The gold embossed-veined leave card is my favorite–stunning! Places, please is a great set and love the small price!! everything is so beautiful, as usual. Love the leaves! We’ve really become spoiled by all of the dies to cut out our images, haven’t we? This is no exception. It will be such a breeze to create beautiful leafy projects now! This is just fantastic. I believe this might be the best release night ever!! Those leaves are to die for. I love everything about those leaves! The veining with the gold embossing is fantastic! Love the leaves…..especially the fact that you can stamp the veins in a complementary color and that there are dies for the large leaves!!!! I can’t wait to see what everyone does with these leaves!! These leaf images are stunning. I love the veining. Wonderful set! Simply beautiful. These large leaves are perfect for the fall, but I can see from you samples that I could be pulling these out all year long! I think your leaf prints and leaf print dies are simply gorgeous! I love fall and this will allow me to make such nice gifts for my family! Thank you so much for the chance to win this fabulous prize package! These are great! The possibilities are endless – thanks for another great set! I really love the ideas for table decorations! I always try to make place cards and decorations to make things extra special on Thanksgiving. These goodies will help me do just that! 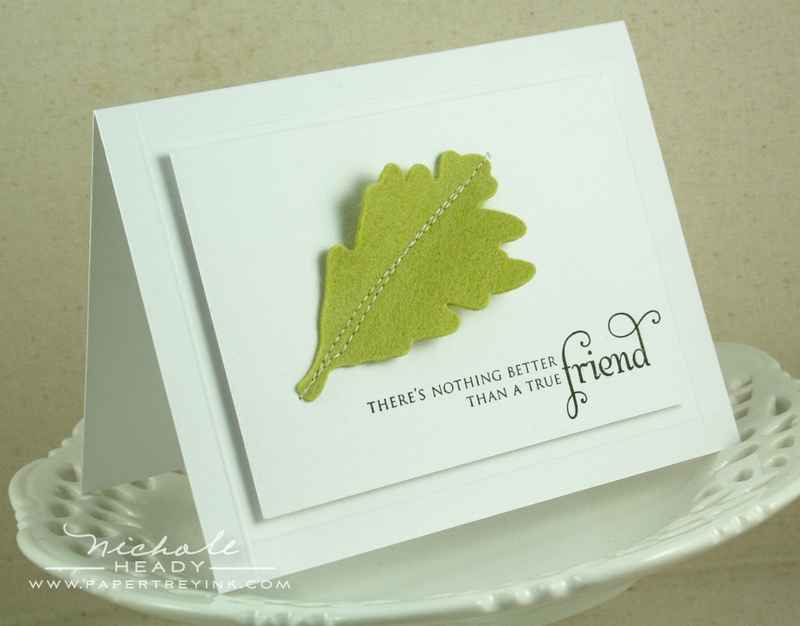 I love the leaf dies – and the projects you created are gorgeous. I Love the new die for the name card too, I can think of many uses for it. Love these leaves! You always think of everything when it comes to your stamp sets and its coordinating accessories. Love the place setting you made. Gorgeous! I love the leaves, and done in fall colors, they are beautiful. i love the place setting with die cuts. very lovely! I can’t wait to cut me some of those leaves. So pretty for Fall. I really like the leaves – the projects shown in the preview are so great. Thanks for the inspiration you bring to us each and every month. I sure would like to win this package. again…you guys are just so talented. Love the leaves. great color combos!! love the leaf with stitching down the middle! Love these sets. The place cards could also be used to identify foods at a buffet….lots of possibilities! I am ready for Fall and this stamp set is contributing to that feeling! The leaves are beautiful. Your card with the gold embossed vein is stunning! I would love to have the Places, please, for the holidays also. Oh wow, I need those leaf prints and dies. I can’t wait to order them. I love that the veins are separate, great for embossing them! Getting excited for tonight, hope I can stay awake that late! Oh My! I am overwhelmed by your awesomeness (yes that is a word, lol) I love everything in this post. The leaves with dies are awesome and all of your samples are just amazing as usual. The leaf images and dies are perfect. This has to be my favorite from this month’s release. I hope they don’t sell out before I can get some! Love, love, love the leaves. Could I possibly love them more than turning a new leaf? It would be a close tie I think! Thank you for the contest. Can’t believe how hard you word. Coming off of road trip to CHA and putting up these great projects. Thank you. These leaves, dies and color couture embellies are nothing short of OMG amazing! I LOVE your projects, Nicole, but the cards just blew me away. Each one is more beautiful as we scroll down to the last. Can’t thank you and the DT enough for the constant inspiration AND the chances to win such awesome prize packages! Perfectly beautiful. Fall is my favorite time of the year because I love all the colors. Amazing stamps and dies. Can’t wait to play with them. Wow! I just love this leaf set with the matching dies! Fabulous!!!!!! Fantastic!!!! Out of this world!!!! Autumn is my favourite time of the year and I just love the leaves set and coordinating dies. So much possibilities. I just love the leaves… and how cool it looks with the autumn colors! These leaves are really beautiful, and the dies will make a great set so easy to reach for. And only $5 for the place card set- wow! What a great deal! Wow! both sets will be so useful, I know we will all be wondering how we went without them for so long!! My favorite from today’s previews is Leaf Prints. I love the way the veining makes the leaves look so real. The die cut leaves used in the candle ring convinced me – I must have this set! Oh my goodness! I am so ready for fall and this release is soooo wonderful! Wow! I love the detail and size of the leaves! The dies will make leaf making a breeze. I love what I see! Scrumptious! Wow another lot of beautiful Autumn sets and so versatile for many uses – love how the place card set & die can be used on standard cards as well. My mind is spinning with new ideas already. Thank goodness you ship to Australia! I like the new leaf images. Fall is my favorite time of the year..OH how nice to be able to utilize these stamps in our card making. I absolutely love autumn leaves…the real thing, stamps, pictures, etc. And now a beautiful stamp set AND dies! How super cool! With Places, Please you created such beautiful projects. Just what I have been waiting for! Now I can get rid of the ‘red rubber’ stamps and order the beautiful Leaf Prints and dies! I have always loved Place Cards and I am so pleased that you have a die and images to make even an everyday meal fun and special. Thank you for such inspiring products. Oh, those leaves are just perfect! Thank you so much for creating this set. From warm and welcoming to cool and refreshing… Lovely! The leaves are gorgeous …. and the dies make it look so professional! 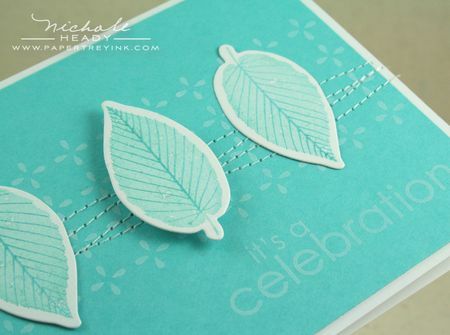 I have also looked for a leaf stamp and am so glad you created one! The dies will be great too. Each year I make a “Thankfulness Leaf Tree” for our family and hand cut leaves for each of us to write what we are thankful for. I am so glad I can avoid cutting all those leaves this year! How wonderful! 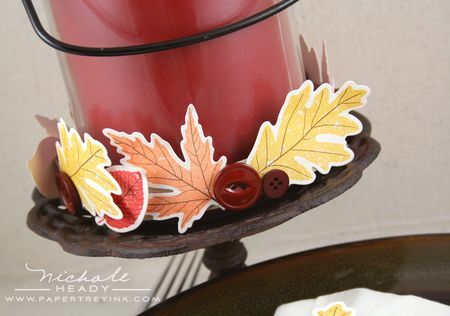 I love the candle ring, and I can’t wait to use the leaves on my scrapbook pages for fall. Thought I could do without the Placecard set, but after seeing how versatile it is, that will have to go in my cart tonight too! Thanks so much for dedication to making my papercrafting so much more enjoyable and professional looking! I love it! LOVE IT! LOVE IT! Perfect for fall (and really any time of the year). Wow u really saved the best for the last! love ll; the leaf images! Blew me away with this set! The big leaves and dies are EXACTLY what I have been wanting forever! I’ve purchased other leaf stamps and tried hand cutting my own versions but they never looked right. Now my heart is fulfilled with this new release. These Leaf Prints and dies are just THE BEST. Very beautiful! And the place card die and stamp set is another wonderful addition to PTI’s lineup. It reminds me of the bookplate die that has been used so beautifully for focal points other than it’s original intention. I just love that! Wow, I wish I could have it all. What fabulous collection Totally speechless. place cards are beautiful! a set would make a great hostess gift! Wow, I thought last month’s release was going to be my favorite of all time. Looks like things keep getting better. I really love the modern look you can achieve with the non-traditional color of the leaves in Hawaiian Shores. 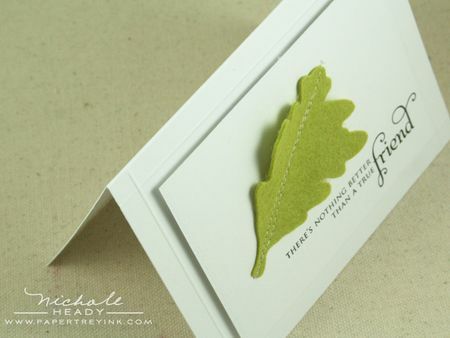 And I can’t say enough about using a simple die cut felt leaf to make a truly incredible crisp clean card. I will certainly be using that technique. Keep up the great work gals. You astound us daily. Simply beautiful samples with both of these sets. I can’t believe what a great value Places, Please, it. Wonderful! BEAUTIFUL is what I think of the sets! Must haves!!! and so EXCITED again for the matching dies!!! I love the leaves…and that they have matching dies!!! These are great leaves! Absolutely fabulous! I love the leaves and dies to go with them. I also really like the color combos for the embellies sets. It should be a fun release tonight! Oohhhh wow! 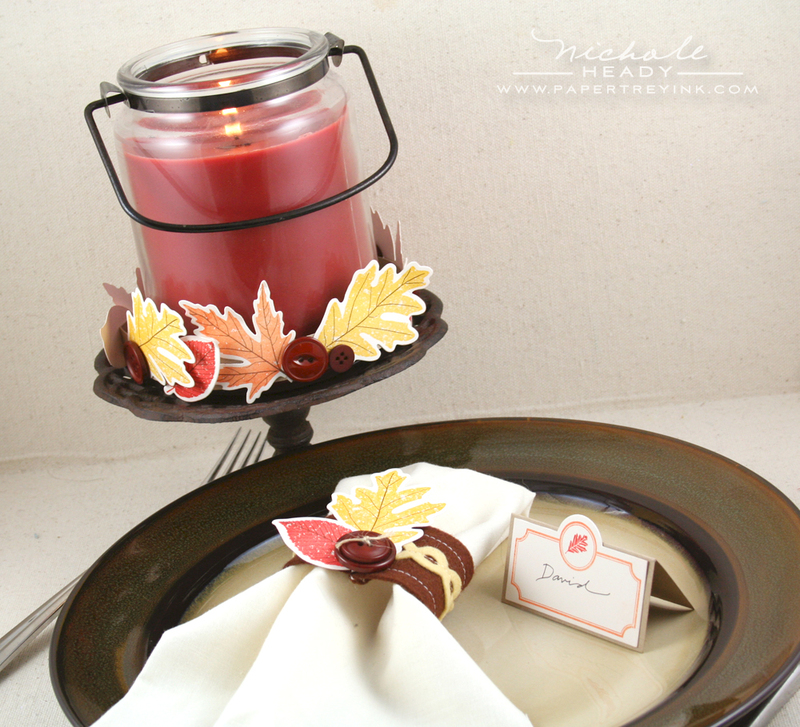 I can’t wait to create gorgeous place settings for my own Thanksgiving this year…thanks Nichole for more inspiration! These would be cool to adore any Thanksgiving table! Autumn is my favorite season. Thanks for the chance to win! I love the leaf stamps and dies. What a duo! Can’t wait to get my hands on the dies to make a huge pile of leaves! Oh, the leaves are wonderful! And Places, Places makes me want to have a party! LOVE the new sets!!! Defintely on my list to get. Can’t wait to start making Fall creations with them. Now if only the weather would match these gorgeous images. Sometimes I wish I had only Papertrey stuff to work with instead of 16 years of stuff. Maybe it’s time to scale back a bit? Such a graciousness about this set. I love the felted leaves and simple stitched lines. Loving this month’s selection so much. The leaves are gorgeous, I can’t wait! Love the leaves! I’ve cut out many leaves. Dies will be nice! Nichole, these are beautiful stamp sets. So many possibilities. . .I’m really looking forward to adding these sets to my collection. I love your samples, as always. Leaf dies! – better than leaf punches…and love all the coordination. Felt with the dies – oh that’s a great idea. Can’t wait to see it all tonight! I just love the holidays and creating things to go with them. Starting your own traditions is so important or adding to the ones you have as child. This set with the leaves is wonderful. I loved them around the candle. I was hoping there would be a die/stamp set for fall leaves…I am also very excited about the placecard die…HOW INGENIOUS! Oh, wow, Nichole! Both look fabulous, but when I saw the price for the Placecard set listed as $5 I thought that was surely a typo. Then when you mentioned it again in the text of your post — well, it’s too good to be true! But I’m thinking it must be true. And I’m thinking that it will have to be in my cart tonight! Wow, I just love these awesome stamps and the coordinating ties are fabulous! Love the leaf dies and matching set so far. Can’t wait to see the reveal on these beauties. I think PTI has become my favorite company! I simply love fall as a time for entertaining! I can’t wait to get the place card set and die! I am so very excited that you have come out with Leaf Prints! After Heart Prints (which I love) I was really hoping PTI would have a Leaf Prints set! I think that the leaf shapes are so beautiful and the veining is a really nice finishing detail! Loving the leaves and the coordinating dies! Great samples! Love the placecards! What a great table decor and the images are lovely!! Thank you for such a beautiful leaf set and the place cards sets are awesome. I can”t wait to make place cards for my whole family. Although I am ready for fall projects, I’m still enjoying summer and won’t dare wish it away. Love the leaf images – they are beautiful! LOVE LOVE LOVE these samples Nichole!! I really like the leaf prints stamps and place die. How unique and fabulous! These are definitely on my list!! This is such a sweet set! I am super, duper excited about tonight…Good Luck everyone! This is my favorite set for this release! I love fall leaves and having been wanting one with the dies it is just like Christmas!! I love the leaf shapes and the coordinating stamps. I can’t wait to add them to my cards. I just volunteered to make place cards for my Brother and sister-in-laws wedding – these will come in great use! Just gorgeous. Love the creations and love the sets! I love leaves and am so much in love with the new stamp set and coordinating dies –definitely a must have. And since fall entertaining is another one of my favorite things, making place cards with the Places Please stamp set and place card die will be a blast. So excited!!! Perfect set for the upcoming Autumn season! Great samples as usual!! Love the new dies!! i kid you not…… you are truly amazing and talented! Love all of it! Wow , All the dies are wonderful. Great Cards, The place setting cards are wonderful. Thanks for the inspiration. Autumn is my FAVORITE season and this stamp set and the diecuts are wonderful!! oh these will be so adorable for thanksgiving!! I am a true summer girl, so fall is far far from my mind. BUT, I love the leaf stamps and dies, and I can imagine creating all sorts of green summery leaf projects with them. Leaves are one of my favorite things! Hope to win!!! I love to scatter fall leaves everywhere, so this is a MUST have…wow so great, can’t wait! I remember the hours… days… weeks spent cutting out hundreds of leaves in garnet and amethyst tones for our fall wedding years ago. Ah, modern conveniences like beautiful PTI dies make it all so easy now 🙂 I love it! Like you, I have wanted a leaf set and have bought several but none are quite my expectations but this set looks great. It was a fantastic idea to make the veins a different stamp and th coordinating dies are icing on the cake. Your projects are all beautiful. Beautiful!! I love the new color couture. Vol 9 is simply amazing!! My son is getting married in October with a leaf theme. This would be a great addition to the decorations and are not completely finished yet. Very cute! Oh My Goodness these leaves are to die for…the stamps the die…how gorgeous! These will be awesome for fall projects! I see a classic set here that will be treasured for a long time. The leaf images are beautiful and I am loving Places, Please. Gotta have it! i just love autumn… this set is so perfect. Love the leaf set and I can’t thank you enough for making coordinating dies. The dies have been a huge time saver and I’m not a big fan of cutting so there are PERFECT!! Simply AMAZING Nichole! Fall is my favorite time of the year….all the beautiful colors! I think your leaves are awesome! Oh joy! No more cutting out leaves! I’m in heaven! Fall is my favorite season so I am loving this stamp set and dies!!! So pretty!! You could do so many pretty things with these! This is an AH-mazing set! I love how you can use leaves to make so many different types of cards! From sympathy cards to ‘just thinking of you’ cards to birthday cards. It’s so versatile!!! The leaf images are perfect! Your cards are stunning! As usual, you have outdone yourself and it will be difficult for me to not press that “want it all” button! This is such an awesome set! I haven’t seen anything like it…soo cool. Love your designs. Gorgeous leaves!! And I am super excited to see the leaves dies!!! The place cards are genius and such a great idea. Love, Love, Love what you did with the leaves. This was another set I was not sure about because it seemed so seasonal. I was wrong again. Thank you Papertrey for another amazing release! Gorgeous, gorgeous. I love the leaf dies and stamps. Such a versatile set too; not just for fall, but all spring and summer too. Love the options of the solid image and the veining. LOVE LOVE LOVE these!!! These dies and coordinating stamps are AMAZING!!!! Autumn is my favorite time of year so I really like all the leaf stamps and dies. I especailly like how you embossed the leaf with gold powder, the candle ring and the felt leaf. Must have, must have everything this month! I just love holiday stamp sets! Great job as always. You girls are sooo creative!!! I am REALLY excited about the Places, Please stamp set and die — I can’t wait to add these to my collection! I will be making placecards for every holiday for sure!!! The leaf stamps are gorgeous! You come up with such fascinating ideas – a candle ring, who would have thought!!!! Genius! I love these leaf images and the dies!!! The dies are absolutely amazing, and I simply must have them; can’t wait! I really love the detail and veining of the leaf images… so beautiful. The coordinating dies will be so much fun to use with this set! Excited to try the place cards set as well! Wow… this set is gorgeous! Thank you for one more reason to look forward to this Fall. As always, your sample cards are stunning! Oh, I just LOVE these fall leaves! So, so pretty! And, I REALLY like them die cut in felt! So warm and cozy feeling! I’ve been seeing Dawn share her projects using the new Color Couture and her latest leave wreath. They are so pretty. Love all the leaves dies. They makes the cutting so much easier. I also am loving the leaf dies and all the other wonderful releases this month! You are one group of talented women, thats all i’m saying! I love the leaf images and to have the dies to with it—just the best. Everything all at once. Thank you so much. It would be so nice to win this set. I love the placecard holder die. And I love leaves, especially as we head into Fall. It is a great set! As if what we’ve seen so far isn’t enough, you go and add leaves with dies. You are too cruel. All the samples are beautiful. The place card stamps with die seem like a really good bargain. Thank goodness order time is almost here or who knows what other wonderful things you would throw in to tempt us. Thanks for another great release. I too have been wanting realistic leaf dies. 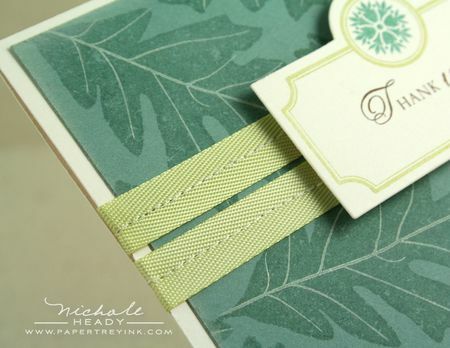 The Leaf Prints die and stamp set look perfect! These sets will make it easy for us to create lovely fall cards and place settings. Don’t want summer to go away yet, but I do want to try out these great fall theme stamp sets! Fall is my favorite season… also when I get the most time to stamp. I love this new collection! I love fall leaves and this set is just fabulous!! Thank you yet again Nicole!! I just love fall and these sets are making me long for some cooler weather. I especially love the vibrancy of the Gold Leaf card. It’s just stunning. These are beautiful. As always I am impressed by how versatile you make a seemingly seasonal product. Excellent job! These are great! I especially love the felt. Love it. I am such a huge fan of dies, that I am enjoying all the coordinating dies with the stamps. I think I might be a little addicted to the PTI dies! I love the leaf dies. Very beautiful projects! Love it all. Can’t wait to order it! I love the leaves and the dies. LOVED the gold-embossed veins! I also like how you showed other ways to use the place setting die and images. So clever! Thanks for the chance to win! Brilliant and versatile! I can’t wait to get my hands on those!!! Great projects! I have been looking for a great leaf die(s) and these are fabulous. Love them! Great leaf dies, stamps and place card dies. I love the leaf images and am really ready for Fall and creating cards reflective of that season. My PTI wish list keeps growing! Love the leaves and dies! Great idea to gold-emboss the leaf vein. Can’t wait to get this set. Wow, the leaf with the embossed veins!!! Gorgeous! These sets really put me in the mood for fall. The place card set is adorable also! OH LOVING those beautiful leaves! And the place card set, toooo cool to be only 5.00! WOWZA it will be so hard to choose what to get, I am love with everything this month! OMGosh!! I am praying for Fall’s cooler weather to come soon! I am almsot 35 weeks pregnant during the HOTTEST summer I can remember and all of the beautiful PTI Fall & Halloween products make me long for sweaters and boots! I think all the leaves are BEAUTIFUL! I love all the details. Thanks for the chance to win, win, win!! oohhhh the leaf stamps and die are awesome….i can’t wait to get them! 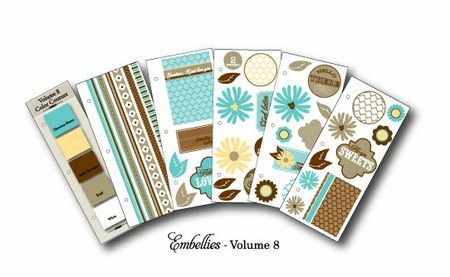 What a fantastic leaf set – and coordinating dies! I really love the candle wreath that you made, it adds a great deal of elegance to the holiday table! I love the leaf dies and I think they look brilliant stitched! I bet they might look cute in fall-patterned fabric also – almost like a cozy quilt on a card. Beautiful! I love the projects and seeing all the possibilities for these stamps and dies. The leaves images are so beautiful. I love the dies that coordinate with the images. The color couture sets are gorgeous. I love it all! I really like how you used the image from Places, Please as a focal image on your card. The leaf images are stunning. I LOVE the leaf set! It seems like flowers and leaves are my favorite “go to” images. Who hoo – these are things of beauty! 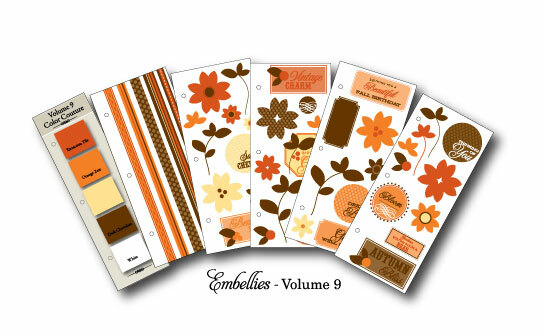 This is definately a must have for all your autumn papercrafting!!! These dies are amazing! All of your projects are gorgeous!! I am craving fall’s arrival and these just hit the spot! Wonderful cards! Beautiful- love the leaves especially! Love it all! I love leaves! I love fall! I am so excited! Cant wait to put them in my cart! Beautiful table setting. I love all of the leaves. can’t wait to see the entire set. Love the leaf images; they are so versatile. I really like your samples…so creative, and truly inspiring! Love the stamps, dies and all the projects! Wow! The fall leaves and matching dies are so much fun! I love how you embossed the veins in gold on one of your cards and the stitching on the one of the others. Such a versatile set! You’ve utterly found my weak spots- entertaining and fall leaves. Must have both! I love the leaves and new die! A must have for Fall!!! Oh my, it’s a good thing I worked some overtime last week! These are all must haves! You guys are SOOOO talented! Oh. My. Heavens. I have to say, I think the best was saved for last. Leaves in all sizes, veins, dies, placecards. I have to win this!!! I am in love with the leaves and the dies! I am floored that the Places, Please is only $5. I am loving all of the $5 sets this year. I think I own them all! I definitely see myself making those napkin rings and Dawn’s wreath. Thanks for all the inspiration. These are absolutely fabulous! Love love love the leaf stamps and dies. And the Places Please is so innovative and will come in very handy for entertaining and cards, too! How DO you do it?!? Absolutely fabulous ideas Nicole!!! It’s another must have Set & dies for me!!! I can’t wait to decorate my Thanksgiving table with some handmade creations!!! The leaves are going to be a wonderful addition – love that there are dies to go with them! I love leaves! You’ve given me so many great ideas and I’m so inspired. These are great to use all year long – not just for Fall! these projects are so creative. i love the stamp sets & matching dies. fall is such a beautiful time of year & these sets will help us to create great projects befitting the season. I love when there are matching dies for the stamp sets. Thanks Nichole and team for another great release this month. The leaves are fabulous! Love, love, love that the solid image and the veining are separate images and the coordinating dies are to die for!!! Places, Please looks to be so very versatile and the colors in the latest addition to the Color Couture collection are just scrumptious!!!!! The samples are amazing. Looking at all the creations I envision the beautiful fall colors on the East Coast….fabulous sets, dies, paper etc. etc. etc….. These sets look fabulous!! I love that you have dies for the leaf images!! These images are so beautiful! I love the size of them!! This set is even more beautiful than I was anticipating! Throw in the dies and I’m am hooked!! Fall is my favorite time of year, so I’m really enjoying these projects. I could see how easy putting together a themed meal would be with these dies. 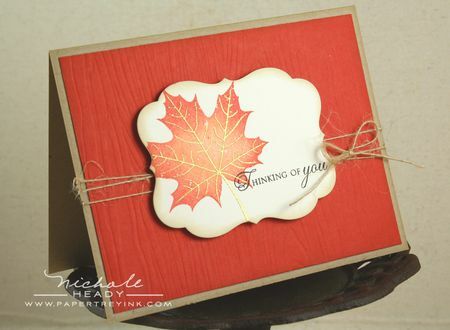 The leaf dies and stamps are very nice–will be a great addition to fall decorating. Have been looking for something like this for a long time. Leaves are great for making masculine cards and the matching dies will make it so much faster to put together!! I’ve been waiting all week to see the leaves set. It is beautiful! The whole release has been fantastic! Love the new leaf set! And the coordinating die make it even better! I love the leaf images – been waiting for these! The place card die is soooo cool – love, love it! Just perfect!! these leaves and dies are great and the place card die is such an awesome idea!! i can just imagine the other cute images in the set and can’t wait to see the whole thing! Leaves are classic and timeless. I so love anything related to leaves and stamps. You can stamp them in any color for any season. Love that. I was on the fence about the place card/die set, but now that I see it in action, and that it’s so affordable, I gotta have it!!! 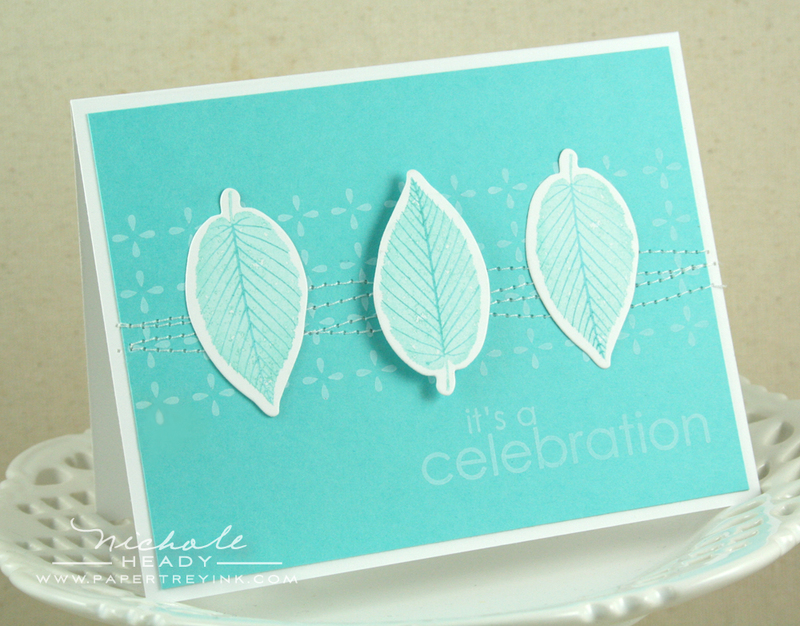 Adore the leaf images and matching dies! Will go so well with the placecard die for the upcoming fall holidays. I especially like the Places Please set and die. I do include place cards for my Thanksgiving and Christmas table. The thank you card shows just how versatile this set will be. Just beautiful! Always love the large images because I scrapbook as well as cardmaking. Of course, having matching dies for everything is soooo fabulous! 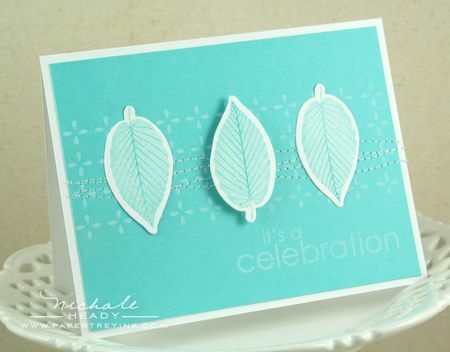 Just love the Leaf Prints set and the coordinating dies too…I’m in stamper’s heaven! FINALLY!!! A leaf set I HAVE to have!!! Where was PTI 6 years ago when I had my fall wedding and was searching high and low for a classy leaf image?!?! LOL!!! This is a “gotta have it” for sure!!! By the way, Nichole, I LOVE the white on white cards you’ve been doing lately. The white “image” portion of the card really stands out and looks so elegant on a white card base when you score, outline with your black pen/s or raise it up with some pop dots. I’m really loving that technique and can’t WAIT until I finish painting my scraproom and get all moved in to try it! Thank you, always, for your BEAUTIFUL inspiration pieces!!! Such fabulous leaves! And the stamp design is genius! I love the leaf stamps and dies. Your napkin rings are so cute. I will have to make some of these for Thanksgiving. I also love the place card so I will try to make some of these also. Lovely leaves! So elegant and versatile! Thanks for the wonderful projects for inspiration. The leaf dies are to “die” for. Beautiful. Love the addition of the Places Please stamp set to the PTI line-up. I love the leaf images with matching dies – what a versatile set that will be, and I can imagine so many different ways those can be used – love the place setting you made, too. Love those leaf dies. I can imagine so many uses for them. Wow!! I LOVE these!! Those dies are so impressive!! Great and wonderful designs!! I love the fall and all the various color of the changing leaves. This season is filled with great color which is why it’s my favorite. so much fun! love all those leaves especially since we don’t get any here in s. florida. I absolutely love Fall and Halloween. They are my favorite time of the year. All of the stamps sets and dies are fabulous and I can’t wait to tuse them!! I can’t wait for fall. So tired of all this heat. Waiting to see the leaves fly to the ground. Can’t wait to make my own leaves fly all over my cards with this new release. These leaves would make great masculine cards and sympathy cards as well. These are great! I really like the die and can see it being used over and over again! Beautiful set and samples! You have outdone yourself! 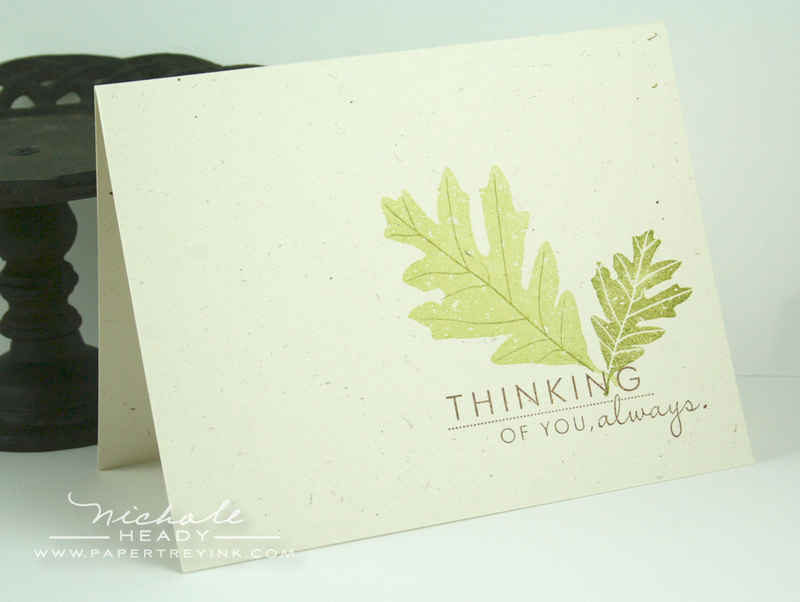 I love all these new releases – leaves are always great to stamp (and scrap). The places please stamps and die look super too, I would like to try them to add class to cards, not just placecards. I really love the one with the felt leaf & the card with the place card, but I have a question about how you stitched it. I see the twill wrapped to the inside, so how did you finish it? Is it overlapped all the way around the inside or do you have a neat way to finish the edges. I’d love to see the inside. Thanks for all the inspiration! Hey, great idea. I never thought of using Kontera for older posts. I really dislike Kontera, but this is actually a pretty good compromise. Too cute Niki! Love the colors, dp and the twine! Of course your coloring is just gorgeous. Happy Thanksgiving! !